ince 1911, Aunt Ruby's Bed & Breakfast has been welcoming guests and providing them with a comfortable atmosphere to enjoy. Whether this enjoyment comes form a cool sip of lemonade on a hot summer afternoon or a nap on the scenic veranda, our guests seem to feel right at home...probably because they are. 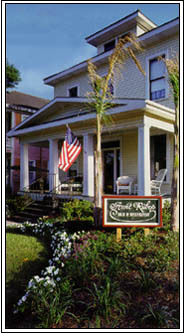 unt Ruby's Bed and Breakfast is conveniently located in the heart of downtown Lake Charles' historic district. We pride ourselves in being members of the historical Carpenter District as well as being the city's first boarding house. Other historical homes and sites are only moments away. e are located just a few blocks from downtown nightlife and a beautiful boardwalk that welcomes itself to breathtaking sunsets.